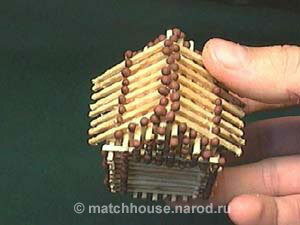 It seems to be an old Russian tradition to make houses from matches as a gift or just for fun. 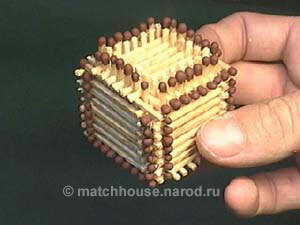 Do you want to learn how to build a house from matches? 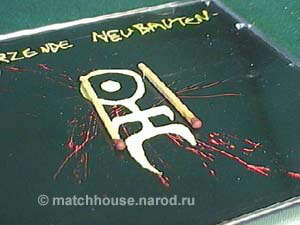 Here is a little howto from the Russian artist G. Wolf. 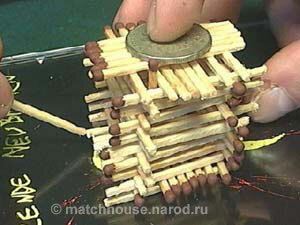 It would be built without a drop of a glue, and you won’t need those tools in order to build a house. 3. A coin, not a little one. Place a CD box on the desk and we’ll start the process. 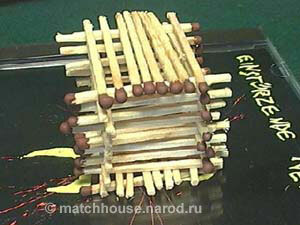 Put two matches, parallel each other, in the distance a little smaller than a length of a match. Now put 8 more matches on top of the first two, like on the picture. 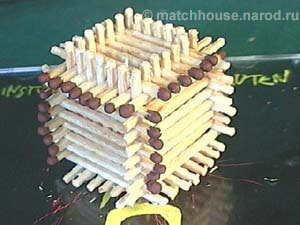 Now put a second flooring of 8 matches, perpendicular to the previous layer. 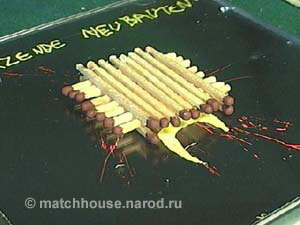 It’s better to put all the matches on an equal distance from each other. 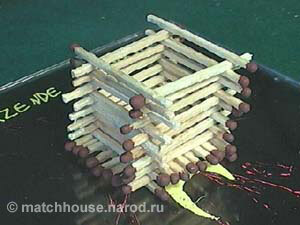 Now we are building a “well”, 8 layers tall, like on the picture. 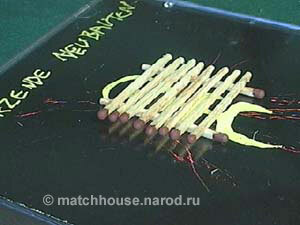 Each next match should be aligned with a head perpendicular to the previous. 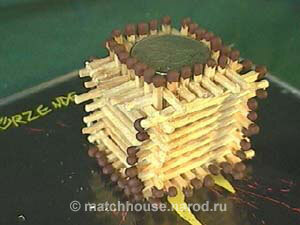 And now on the top of this well we are putting another deck of 8 matches. 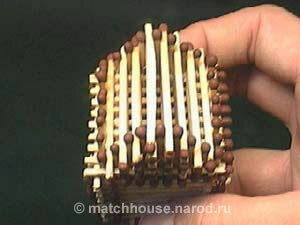 Matches on the top deck should be aligned contrary to the lower one. Now on the top of our thing we are putting a coin. 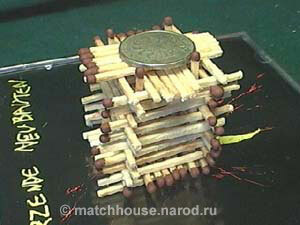 Now pressing on the coin with one finger, insert a match in each corner, as shown on the picture below. 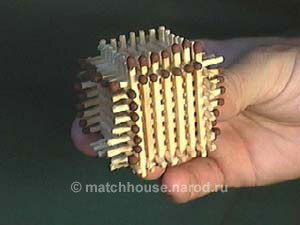 If there is no space between lower matches you can slightly spread them with another match, as shown on the photo. 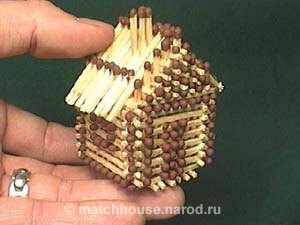 But be carefully so that a “house” won’t slide from the lower deck of matches. 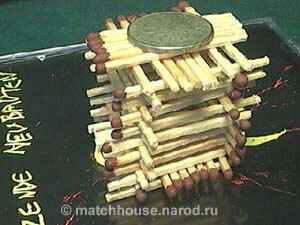 Now carefully inserting matches between the corner ones, across the perimeter, sliding apart the matches with another match, and pressing with a finger on the coin. 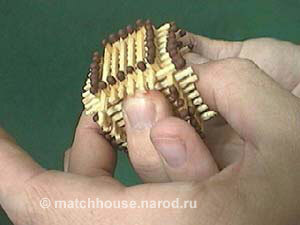 And now after all the matches inserted, press on the wall of the house with your fingers, and remove a coin from the top with another match. Like on the picture. Now you can take the house in hands. 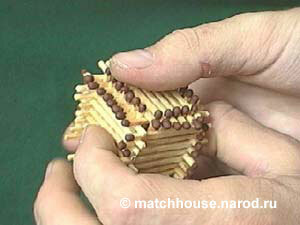 Now push these last matches on the top even more further so that they press the deck under them. Like on those two pictures. Do same thing from three other sides. Congratulations! That’s all! Your house is ready now! You can decorate it with a chimney – insert four matches in the roof near each other, or you can add a door and a window – break a few matches by half and insert into the wall pointing the contour of the door or window. 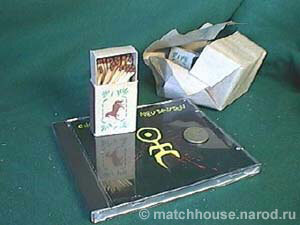 It can be a good present to someone or you can just burn it for fun. Keep out from the reach of children! Looks very nice, just tried making one, bit difficult. god, grow up…. You are so annoying, geez. No one cares what your e-mail is, or that want mick… whatever… GET A LIFE. yes it’s hard, so what??? just keep trying. 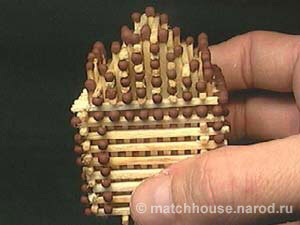 This is to let you all know that there is a person in the mountains of E. Tennessee that builds all sorts of items out of Matches with burnt heads, he has been building these crafts since the late 50’s, also he has pieces in museum. Send him an e-mail and he will send you some pictures of these crafts. Nice! 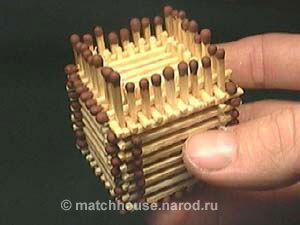 I tried building one, and it worked!!! This is great. I am going to try it and I hope I don’t burn my real house down! I built it and it seemed very solid at first, but after it had sat on my desk overnight, the whole thing just came apart at the seams when I tried to lift it. Is there some sort of trick to make one that actually stays together, or is it just a matter of glue? 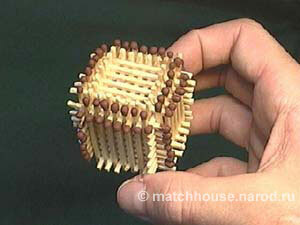 People who live in match houses shouldn’t throw stones. Very interesting house! Thanks for the idea! I like historical districts too. That one was not for sale. That area of the Eastern Shore is where some of my ancestors came to live in the mid 1600s. I’m looking to buy land there and the Blue Ridge/Shenandoah Valley area as well. My parents are going to sell their property and land in AZ. I use to spend weekends with TT2 he lived to be pretty old. That way I could work full-time and go to school full-time. I got one of these as a gift in an airport in Belgium, I had given a girl €2 as she was short money for the vending machene & she came back during the night while I was asleep & left it with the lady who i was beside & asked her to give it to me. It’s one of the best presents I ever got! Cool! It works! Now it starts falling apart a little bit, so I’m going to put it on top of my closet.